Beigli for sale. Buy online at Zingerman's Mail Order. Gourmet Gifts. Food Gifts. Hungarian cinnamon rolls. Without the cinnamon. 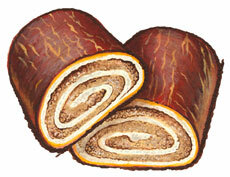 Beigli (bay-glee) is a yeasted dough rolled up with a sweet filling made of finely chopped walnuts. The outside has a nice shine to it and an unique crackle appearance. Inside, it has a trademark swirl that reminds you of a cinnamon roll standing on its side (though there's no cinnamon inside). The buttery dough made with organic flour and the rich walnut filling blend perfectly together, balancing the sweetness of the inside with the satisfying chew of the dough. Comes in a muslin gift bag nestled inside our fun, colorful cartoon gift box.